New replacement 1967 - 1968 Firebird "Sprint" decal kit. This authentic replacement decal kit fits like a glove and is a correct replacement for your worn or missing factory install stripes. 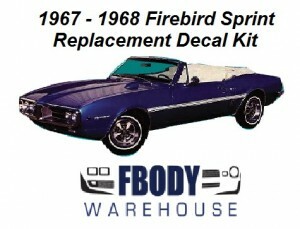 Buy your decals from Fbodywarehouse and know you are indeed buying the best decals in the industry! Produced by Phoenix Graphix your rear spoiler decal will last for years to come!